Wherever you live in this small country of just over a million people, you are near the birch and pine tree forest stretching to the sun and covering more than half the country. 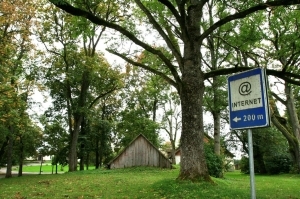 That forest is wired, by the way, because this is a land of sophisticated techies, who invented Skype, whose national elections are done from home computers, and where kids learn how to code software as soon as they go to school. The cuisine, fashioned around products of a rich and fertile land, is just as sophisticated as are the people who defeated their foreign occupiers by singing and joined the EU in 1991. But let’s back up a few centuries. 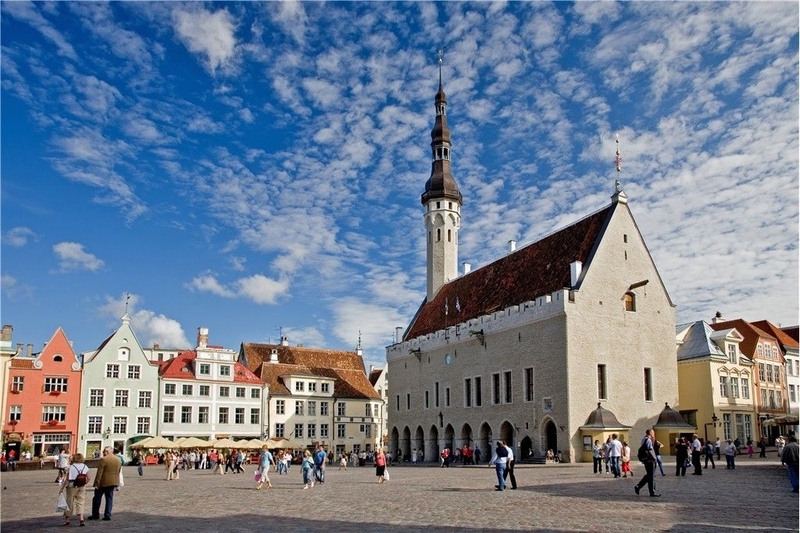 Estonia was part of the Hanseatic League during the Middle Ages and because of all the trading among the Baltic countries, enjoyed products and spices from all over the world, which they often used to enhance their own food. Over centuries of occupation by others, most recently, the Soviets, their national cuisine was replaced by the products of the occupiers. Now the focus is back on its own culinary heritage. In fact, with its “Flavors of Estonia” program the country promotes culinary arts and introduces itself as a land of good food. 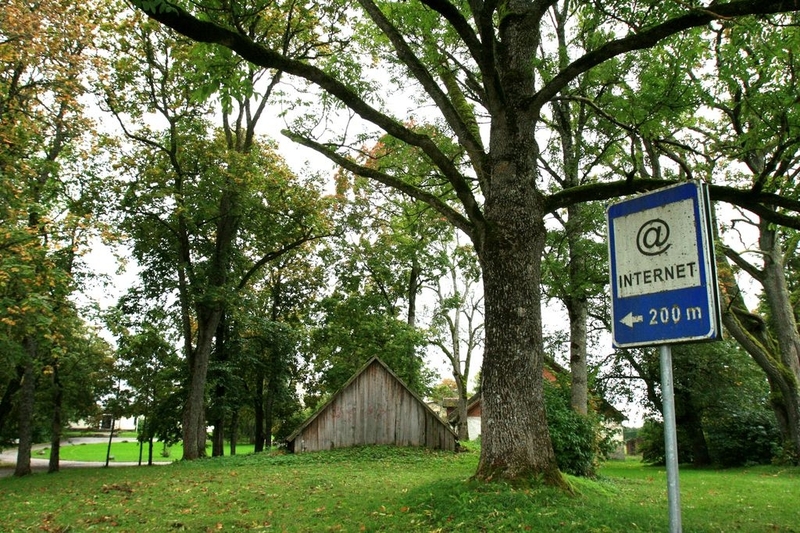 Even in the forests of Estonia, you can find an internet connection. My first introduction to Estonian food was in a New York restaurant with a young Estonian chef, Andrey Korobyak, who learned his craft at his country’s culinary school and best restaurants. He prepared a dessert with kama, a finely milled mix of roasted barley, rye, oat, and pea flour. This was a base for a rich yet airy blend of yogurt, ginger, vanilla and whipped cream, presented on a stone tray surrounded by tufts of moss, reminiscent of the forests of Estonia. Kama, I later learned, was created in the Middle Ages from what was left on the old mill floors and given to the poor people. Today, of course, it is the go-to food for Estonians to mix with yogurt and berries for a quick snack. Jätku leiba means “May your bread last,” which is the Estonian equivalent of bon appétit. When an Estonian asks what they can bring to dinner at a friend’s house, the response is always, “Bring the bread.” In Tallin’s Medieval Old Town, a UNESCO world heritage site, there is a street called The Bread Passage, which has always been lined with bakeries. This black leavened rye bread that is baked daily into a variety of shapes and sizes, is beloved by Estonians and Leib ja Aed, one of Tallin’s top ten restaurants takes its name from this staple, which is considered the soul of the meal. At this charming Old Town eatery it comes to the table with a little pot of butter, while you wait for your mushroom ragout with local kale, or pan fried perch with parsnip cream and leek sauce. With the bread and butter in most homes and restaurants, is another product of the forest, butter knives made from juniper, which is endangered in most of the world but grows here in abundance. 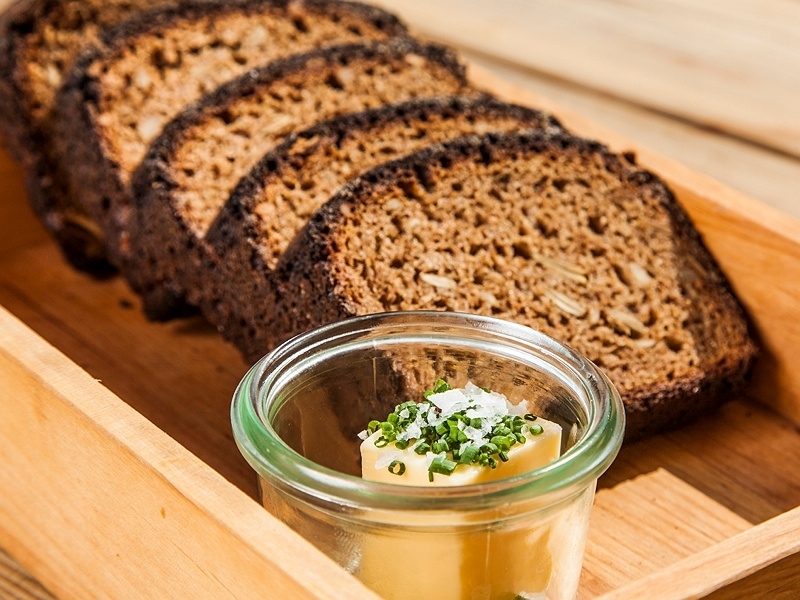 Estonia’s beloved black leavened rye bread. 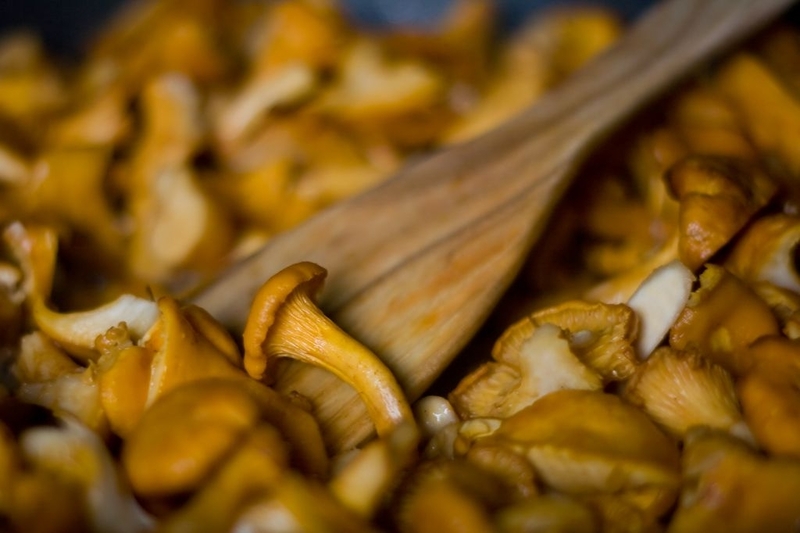 Some foodies may think foraging was invented by the chef from the famous Copenhagen restaurant, but it has always been a way of life in Estonia, whose forests are veritable Gardens of Eden full of berries, nuts, sorrel, wild thyme and 30 different kinds of edible mushrooms. (There are so many wild berries that while a tour bus driver waited for his group to return from a walk in the forest, he picked a hatful of blueberries.) At Tallin’s Kaks Kokka (Two Chefs) restaurant, wild herbs are used to create the soul-satisfying Green Forest Soup with a base stock of Jerusalem artichokes and wild herb puree, of nettles, dill oil, and ramps. At Neikid restaurant just outside Old town, a crème brulee flavored with fresh mint got a “wow” response from diners. Foraging for mushrooms such as chanterelles and porcini in August and September is viewed as quality time spent with friends and family. “We rarely come back from the forest without some of these things,” an Estonian woman told me. 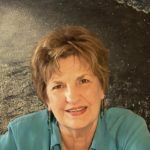 Every household has wicker baskets, and children are taught in school to identify edible mushrooms and how to pick them so they don’t harm the roots.” You will find these mushrooms on many restaurant menus. For example, at Noa, recently named the country’s top restaurant, a remarkable place on the edge of the Baltic with a view of the Tallinn skyline, chanterelles in a butter and wine sauce are tossed with pasta. “We love our gardens, too,” the woman told me, and many Estonians also have greenhouses for year-round vegetable growing. The island is abloom with apple and juniper trees, as well as grazing cows and sheep, for this is an important dairy and meat farming area, that celebrates its local food each September at the toidufestival. Fishing is for sport as well as supplying the restaurants, where you might enjoy flounder smoked in apple wood and alder. The restaurant at the Georg Ots Spa, (named for a beloved Estonian opera star), served smoked trout gently grilled with onions and red pepper. 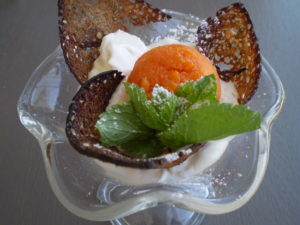 And here was my next chance to enjoy a kama dessert, this time with sea buckthorn sorbet, rye bread crisps and a fresh mint sprig. Sea buckthorn berries grow wild here and are used to add a delicious lemony tang to sauces and cocktail mixers. Another ex-pat, Martin Breuer, left his business career in The Netherlands to create Estonia’s first boutique hotel eight years ago on the small island of Muhu. 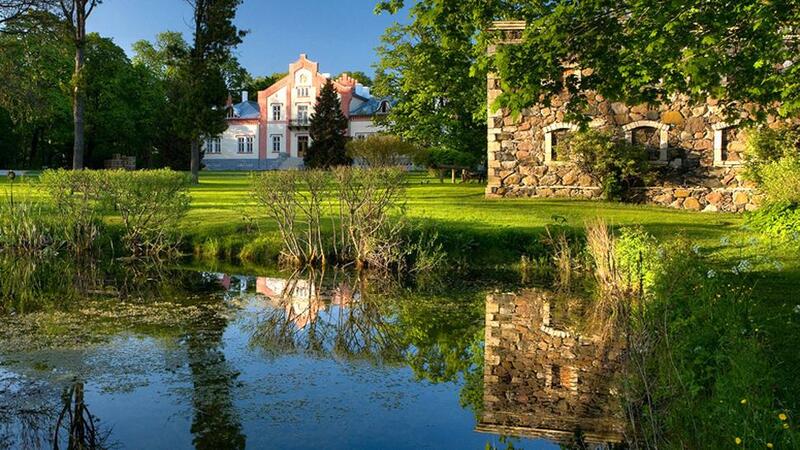 Padaste Manor, the only five-star hotel outside Tallin, is a restored 16th century estate with 23 rooms among the buildings, with a focus on simple luxury. Once occupied by the German and then Soviet armies, it also served as a fish distribution center, then a home for the elderly until 1980 when the roof collapsed. Breuer said trees were growing through the windows when he first saw it, but he loved the soul of the place. 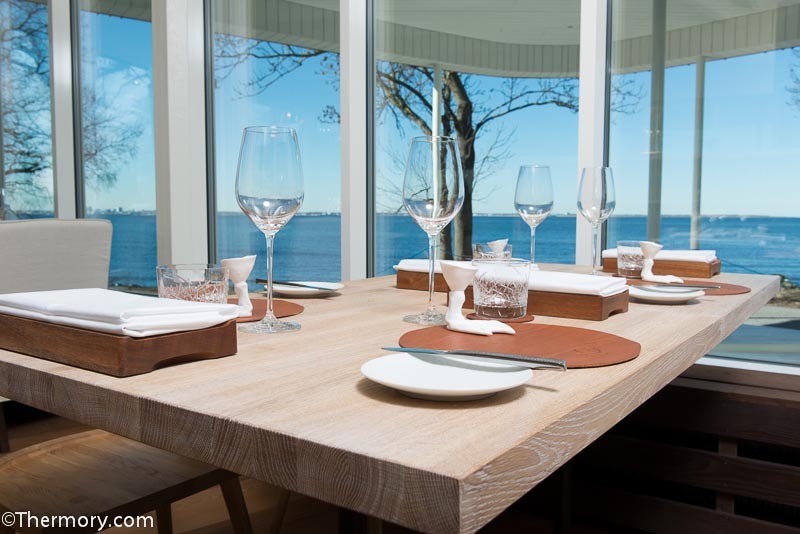 For the past three years, the resort’s restaurant, Alexander, has been Estonia’s top rated restaurant (nudged down a notch this year by Noa). Chef Yves Le Lay, focuses on terroir and seasons with products from the island’s farmers, hunters and fisherman. 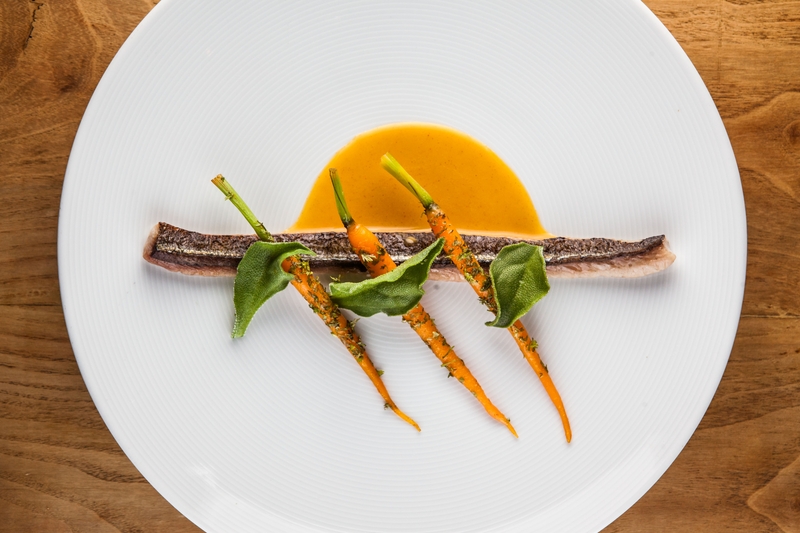 Needlefish with carrots at Padaste Manor. Dinner is a ten-course tasting menu that changes daily. Fresh baked black bread is kept warm on a tray of hot rocks. The island’s beef tartare is accompanied by local green tomato; just-caught needlefish may be served with sea buckthorn sauce and baby roasted carrots. The annual fall mushroom weekend allows guests to join the resort’s horticulturist and chef to forage for mushrooms, and then participate in a five course tasting menu with these mushrooms. Reluctantly, I took my leave of this lovely and surprising country and headed to the Tallin airport, where, much to my delight, I discovered a lending library. It was furnished like a living room with comfy chairs and shelves of books that travelers could take with them, and where they could leave behind the books they had finished. But why am I surprised? With one of the highest literacy rates in the world, Estonians love books. For the journey home, I also stocked up on some Kama bars, Estonia’s healthier and tastier answer to our Milky Way. For more information about Estonian cuisine, visit www.visitestonia.com/en/thing-to-see-do/eat-drink , the food blog: www.nami-nami.blogspot.com, and www.toidufestival.com. Wow, who knew. What a great piece. The food sounds wonderful and the photos really make me want to go. Terrific story, Marian. Really makes me hungry for some kama. What a wonderful refreshing place to explore. I’m putting Estonia on my bucket list. All true. Also Viinistu by the sea in the Lahemaa national park has a great restaurant (and yacht harbour). 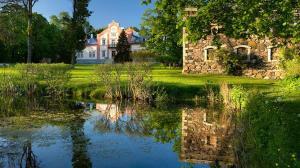 The various astonishing country houses in the park – Palmse, Sagadi, Vihula – have fine dining and stylish hotels. Wow, Marian . What a great revue, hope you got to go to all the different restaurants and taste all of the foods you mentioned, specially the place with the ten course tasting menu. 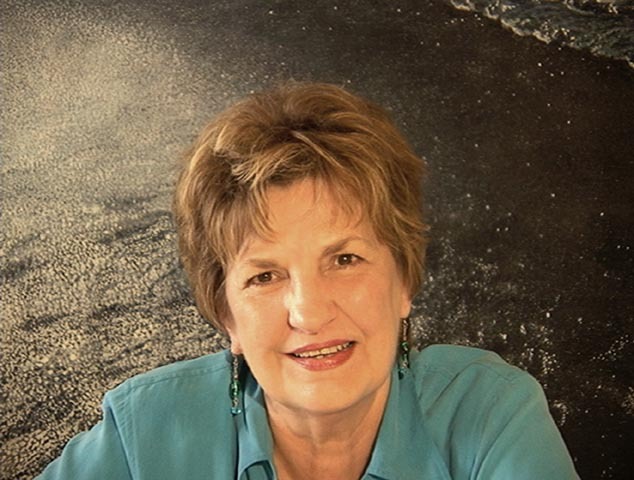 Love your writing and your historical description of the country . Hope you get to go back.